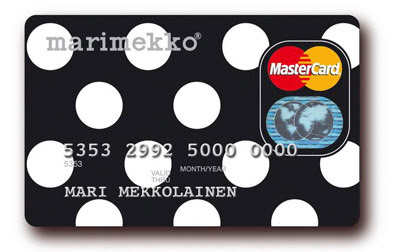 I was catching up on reading Marimekko's blog always mod last week and I discovered that they have a new range of wallpaper, and in Finland you can get a Marimekko Mastercard. How fabulous is that! 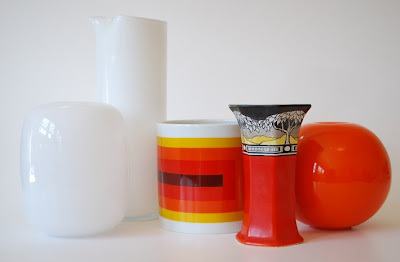 It reminded me of a post I wrote this time last year about my seventies style Marimekko childhood and I thought it would be worth a revisit. (although, obviously not from the seventies). In the '70s my parents had an interior designer redecorate our house. Our family home was architect-designed in the early '60s and had floor to ceiling windows taking up at least one wall of every room. Combine that with new cream shag pile carpet, funky curtains, blinds, bedspreads and tablecloths all by Marimekko and you'll get some idea of the style of my childhood. 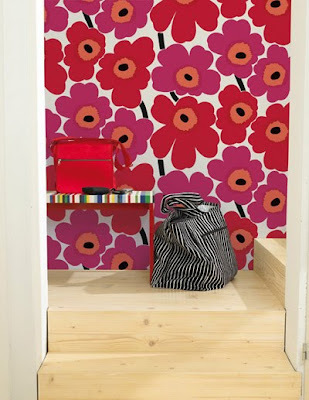 Our double height laundry blind was in the classic red 'Unikko' pattern. My mum (who would have loved to have a Marimekko Mastercard) even dressed herself, my sister and I in Marimekko clothes... and underwear! Unfortunately I don't have any photos on hand to show you - I mean of our Marimekko lives, not our underwear. My parents took literally thousands of photos, but they are all on slides and I haven't yet been able to face the enormous task of sorting them and getting them transferred to disc. At the time Mum also bought the wild Acapulco design Villeroy and Boch dinner set "for good", and the now much sought after Arabia Rustica dinner set for "every day". We ate with Georg Jensen cutlery and I was surrounded with beautiful Scandinavian and European design pieces. My bedside table was lime green, made by Kartell. 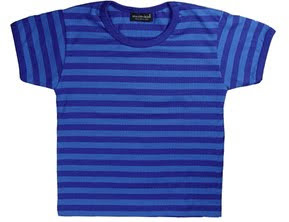 I had so many clothes in the Marimekko stripe fabric like the T shirt above. I wore maxi dresses, nighties, T shirts, singlets - in stripes of every colour. 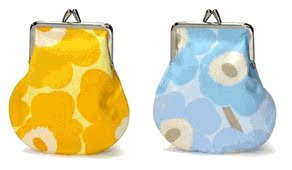 And my collection of Marimekko coin purses surely must be unrivaled. Although as a child and teenager I think I took it for granted I am now incredibly grateful for the exposure I had to the pureness of Scandinavian design. I'm thankful to my lovely mum for (amongst a whole list of other things) instilling in me a love of good design and an appreciation of buying quality. I know that it has shaped a significant part of my design aesthetic.